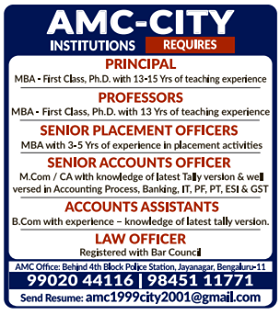 AMC-City Institutions, Bangalore has advertised in DECCAN HERALD newspaper for the recruitment of Professor plus Principal jobs vacancies. Interested and eligible job aspirants are requested to apply by earliest. Check out further more details below. About College: The Administrative Management College started in 1987, under the Paramahamasa Foundation Trust. The Institution has moved from strength to strength in the 27years of its existence. Administrative Management College offers a number of Under Graduate and Post Graduate programs, which include B.Com, BBM, BHM, BCA, B.Sc. MBA, MCA and M. Sc. Each Program is comprehensive, to provide the students with sufficient inputs and training, to embark on a professional career. Apart from providing core inputs related to the specific program the student will also be provided with an exposure to inter-disciplinary areas. Students will be trained to increase their competence in communication skills, reasoning skills, critical, creative thinking capabilities and a capacity to drive for continuous self learning towards individual development.